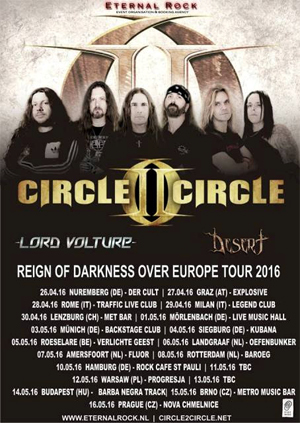 CIRCLE II CIRCLE, the band featuring SAVATAGE vocalist Zak Stevens, have announced a string of headline tour dates for Europe in support of their new album, Reign Of Darkness. The tour kicks off on April 26th in Nuremberg, Germany and wraps on May 16th in Prague, Czech Republic. The complete schedule can be viewed on the flyer below. CIRCLE II CIRCLE is a band that has been reinventing themselves through the years, but maintaining that signature sound that fans around the world love – Reign Of Darkness is no exception to that attitude, bringing out the very best CIRCLE II CIRCLE has to offer. Reign Of Darkness features the powerful metal sound, strong hard rock riffs, both emphasizing Zak Stevens’ passionate melodic rock vocals. Again, the band has created something new, something fresh and vigorous.